Through the study of ASL, Chinese, French, German, Japanese and Spanish, students acquire the linguistic skills and cultural information that permit them to communicate in the target language. Students are mainly from the transfer student population. Faculty are making special efforts to accommodate “special needs” students, especially those who are less well-prepared for college study and those who experience anxiety about language study. Criteria for measuring effectiveness include faculty performance, student evaluations, course completion rates, student-centered instruction and enrollment trends. Significant Anticipated Changes include the increasing number of study abroad programs, effects of budget constraints (lack of French/Spanish position and loss of previously allocated funds for tutors), and the potential addition of ASL to the World Languages program. The Program Self-Assessment found the following: Strengths include contributions to the college’s strategic directions, generally upward or stable enrollment trends, student evaluations, student transfer rates, expertise of faculty, student-centered instruction and faculty participation in professional development activities. Faculty create and implement new formats for language courses (hybrid/ITV courses) and develop extra-curricular activities for our students. World Languages faculty received an Outcomes Assessment grant and created an assessment rubric for student written work in order to standardize grading procedures. Faculty members share their knowledge and experiences with the campus community by giving presentations and they actively participate in a variety of campus committees. Partnerships include those institutions with which we have offered ITV courses and also potentially an international business in Seattle and China. Use of technology has increased: courses are offered in telecourse, hybrid and ITV formats. Areas needing improvement include too much reliance on associate faculty, lack of up-to-date language learning technology (e.g. language lab with interactive stations or a CD burner in the Media Center), lack of systematized placement tools for language programs, classroom spaces unsuited for language learning, and limited tutoring resources. While enrollment is generally stable, faculty recognize the need to continue work to generate more FTEs. Superficially, it makes sense to transfer ASL to the Humanities Division. More research will be done concerning whether such a move would truly benefit the program. There has been positive achievement of 1999-2000 and 2000-01 program goals: Faculty have obtained an Outcomes Assessment grant and developed a writing rubric. Faculty members have continued their associations with professional organizations. 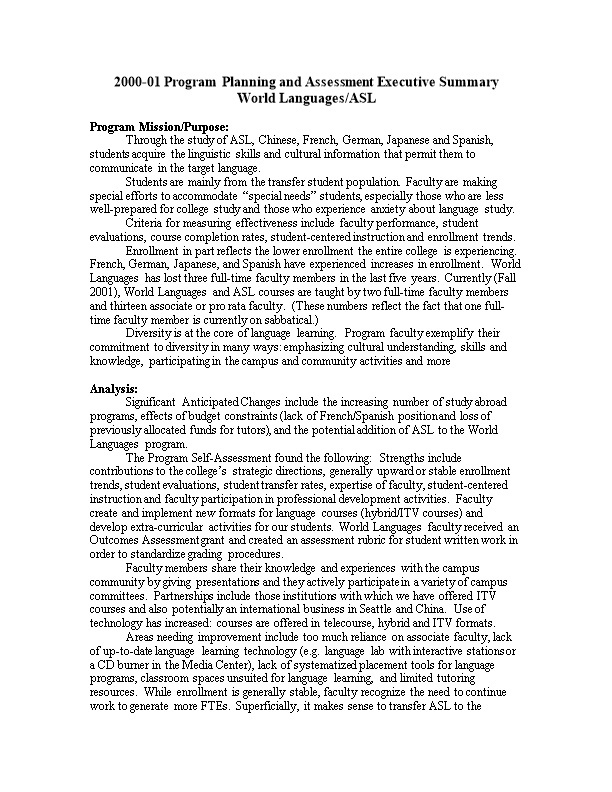 To increase student retention, faculty have requested a French/Spanish full-time position, have revised curriculum to address the difficulties of first-time language learners, have discussed offering language instruction in longer blocks of time, have provided the opportunity for students to take at least the first two quarters of a language with the same instructor, and have acquired language software for student use. To increase the variety and flexibility of our offerings, faculty have requested “smart podiums” for our classrooms, have offered courses in alternative formats (telecourses, hybrid [part on-line/part in-classroom] and ITV courses), and for special populations (Spanish for Health Care Professionals). To more properly reflect current trends, the program title Foreign Languages was changed to World Languages. World Languages faculty hope to expand the program by creating a brochure to promote language courses, offering additional languages (such as Italian or Russian), expanding offerings in alternative formats and continuing to request a full-time French/Spanish position. To increase language learning technology, faculty will offer more ITV courses, arrange for faculty training in useful programs (e.g. PowerPoint), increase use of computer programs/on-line resources/textbook supported technology in courses and develop individual language websites linked to the Humanities website. Faculty will continue professional development activities and program assessment efforts (e.g. another assessment grant for creating an oral rubric and revision of MCOs). Faculty will attempt to regain previous funding as well as investigate new funding sources for tutoring. ASL faculty will advocate for an ASL lab and state-of-the-art equipment for this lab. Faculty will collaborate with instructors at other institutions to achieve parity in the ASL curriculum and facilitate a good relationship between the ASL programs of SCC and Gallaudet University. ASL also has to more clearly define its mission, as world language and/or as a tool for deaf communications.